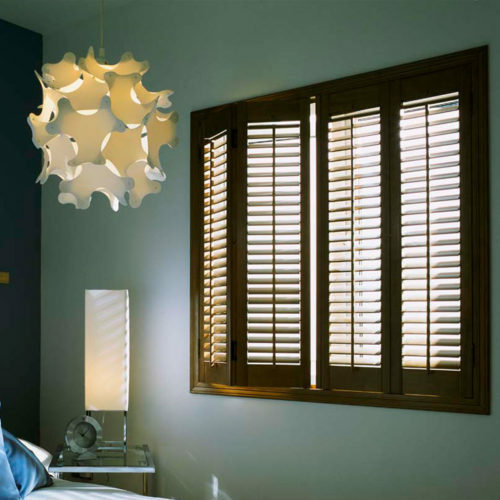 Our team of surveyors, joiners and fitters have years of experience in crafting and installing bespoke wooden shutters in an array of sizes and shapes. We can create a shutter solution for any opening; from the timeless look of full height or café-style shutters, to tracked shutters, which glide along a tracking system allowing for smooth and effortless opening and folding. All shutter finishes, styles and materials are tailored specifically to your needs and vision, with our team on hand at every stage of the process to ensure you get the perfect look for your home. Offering low maintenance (great for dust mite allergies), increased privacy and most importantly, timeless aesthetic appeal, shutters have a number of benefits over curtains, blinds and other window dressings. Our shutters can be crafted in a number of different styles to complement the look of your home. We can also measure and fit specially shaped shutters to fit arches or other architectural features. An elegant, timeless choice of window shutter. A popular style often seen in townhouses and eateries. The perfect choice for wider windows and door spaces. Our shutters are available in 6 different materials, as well as coming with a selection of louvre options to fit your needs. You can also choose from a huge variety of stains and paint finishes – meaning there’s something to suit almost any style of property. A family-run business, our ethos is on providing a professional, honest service that you can rely on. We thrive on exceeding our customers expectations – why not see what our previous clients think and read our some of our reviews. From our first meeting to our last, everyone at Sunburst really helped with the daunting challenge of finding the correct shutters for our home – AND WE LOVE THEM! The team at Sunburst got the job done splendidly.